Each year scores of people need to seek medical advice after eating toxic varieties of mushroom that they have picked themselves. 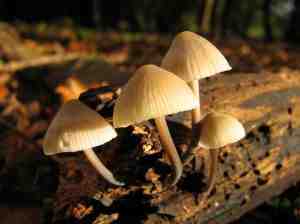 Some varieties of mushroom, which grow wild in the UK, are so toxic that can they can prove fatal if eaten. Foragers should also remember that the toxins in some of the most dangerous mushrooms are generally not destroyed by cooking. So far this year the National Poisons Information Service, which is contacted by frontline medics who need expert assistance when dealing with poisonings, has been consulted for advice on treating more than 120 poisonings with 45 of those cases classed as moderate or severe. "The mushroom season is just getting underway in earnest which is why we need people to be aware of the potential dangers involved in this activity," said Dr John Thompson, the Director of the NPIS unit in Cardiff. "While many mushrooms growing in the wild are delicious and safe to eat, it is not always easy, even for people with experience, to differentiate between toxic and non-toxic species. The NPIS therefore advises that people should not eat mushrooms collected in the wild unless they are familiar with the various species that grow in the UK and are sure that the mushrooms they have collected are safe to eat." In 2010 the NPIS saw 316 cases of poisoning linked to eating mushrooms, numbers were believed to be high because the weather in late summer/early autumn led to a bumper crop of wild mushrooms. So far this year a slightly cooler summer has meant mushrooms have not yet grown quite so well - despite this, the service has still received queries linked to 129 cases. Most cases of accidental ingestion of mushrooms are seen in children under ten and they do not usually result in severe symptoms. Enquiries concerning adults often occur after deliberate ingestion of mushrooms collected in the wild - and so far this year nearly 40 cases involving adults have been reported. Dr John Cooper, director of the HPA's Centre for Radiation, Chemicals and Environmental Hazards, which commissions NPIS, said: "As people head out to gather wild food this autumn they should be aware that there can be dangers involved. Correctly identifying the mushrooms that are safe to pick and eat is the key to ensuring that foraging is good fun - and does not become a danger to your health."